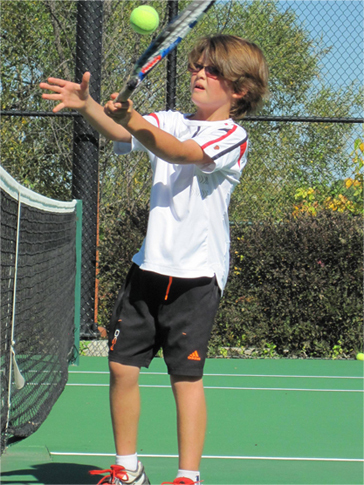 Rich Urso, Head Tennis Professional at Stonebridge Golf Club has taught tennis to children and adults the past forty years. He has played tennis on all three surfaces, and won the Clay Court Championship held at Greenlawn, Long Island in 1989. He leaned to play tennis while growing up in Queens, NY, home of the West Side Tennis Club, where he saw many tennis legends play. He has a B.A. in Secondary Education, and an M.A.in History from St. John’s University. He has completed 18 credits in Coaching Fundamentals, and 16 credits in Medical Aspects of Coaching given by The Hospital For Special Surgery in NYC. He is CPR certified by CPR Works of Charlotte. He has run numerous camps and clinics for various organizations such as the New York Junior Tennis League, Manhasset Summer Center, Glen Cove Tennis, Marvin Ridge High School, and Stonebridge Golf Club. He has coached three high school teams. In 2008, he coached the Marvin Ridge Boy’s Team to the Quarterfinals of the North Carolina High School State Championships. Many of his players have gone on to play tennis in college. He is the current Girl’s and Boy’s High School Coach at Union Academy, and runs summer camps and clinics at Stonebridge Golf Club Tennis Facility in Monroe, NC. Coach Rich Urso is married to his wife Leslie, an RN. They have two children, Jeremy who lives in Savannah, Georgia, and Bradley who is a student at Appalachian State University. Copyright 2008-2019 www.secondservetennis.com All Rights Reserved.